Those who yearn for long hair don't have to wait months to grow it themselves. In just a day, hair can go from short to shoulder length at Salon Bearde in Mission. 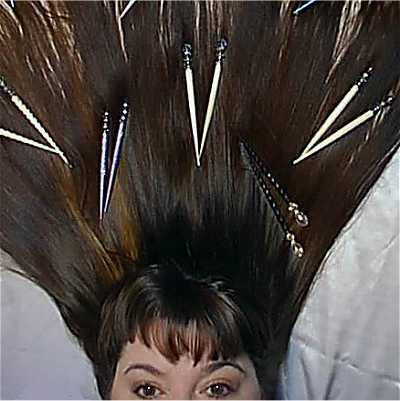 The secret is hair extensions, strands of human hair that are attached to the customer's own tresses. Salon owner Beverly Bearde and her son, Michael Bearde, have been trained in the application process that bonds the extensions to the customer's hair. "It's a European technique," Michael Bearde said. "Once the strands are attached, you can swim, shower, ride in a convertible, brush your hair." Extensions are used by both men and women who want to lengthen, add volume or highlight their hair. The process is not painful and does not involve glue, Beverly Bearde said. What you do need, however, is at least five inches of your own hair -- and the time and money to invest in the process. A full head of extensions can take a day in the chair and cost between $300 and $1,800. Once attached, the extensions look natural and last four to six months. "They are a real confidence booster," Beverly Bearde said. Bearde opened her shop about 28 years ago, after she completed the cosmetology program at Kansas City Kansas Area Technical School. Her son joined her about six years ago. They work with four other stylists. In addition to hair extensions, salon services for men and women include haircuts, coloring, highlighting, perming and waxing. Cosmetology is one of the top 20 business opportunities in the country, said Stephen J. Brown, an instructor of cosmetology at the vocational school. "There are at least three to four job opportunities for every graduate of our program," Brown said. Those who are interested in owning their own salons are encouraged to transfer 36 credit hours of the program to Kansas City Kansas Community College or Donnelly College. Taking entrepreneur coursework then for an associate degree will help with needed business skills, Brown said. In the cosmetology program, students complete 1,500 clock hours and study subjects such as diseases of the hair and scalp, sanitation and safety, cosmetic chemistry, and anatomy of the head, face, neck and arms. The school has a waiting list and is now accepting applications for February classes. • Kansas City, Kan., Area Technical School 2220 N. 59th St.
© 2003 Kansas City Star and wire service sources. All Rights Reserved.